Instagram's new standalone cinematic timelapse creation tool, Hyperlapse, has been incredibly popular. Now, the camera app maker has introduced a crucial feature with its latest app update - selfie timelapses or "selfielapses," if you will. It could be a neat artistic tool, letting users keep the camera fixated on their face while people and surroundings whizz by. 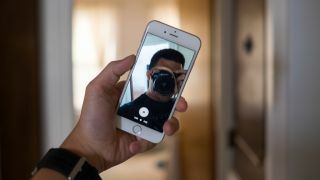 The developers behind the Hyperlapse apps also suggested users could document self-transformations with the new feature, such as getting a haircut or putting on makeup. Just like shooting hyperlapses with the rear camera, the app will smooth out camera shake, a particularly useful feature for users with wobbly hands. Users will also be to share their short motion clips on Facebook, Instagram and save them to their phone's camera roll. Looking past the self-centered nature of selfies, the new Hyperlapse app update could lead to a creative new set of short motion clips. Just please no selfielapses showing the difference between duck and sparrow face.